Does the above painting look a little familiar to you? Surely I don’t mean my mum, haha! And I know you know what I’m referring to - The Van Gogh almond blossom painting! This is my main lesson for Paint Your Heart and Soul 2019, a year-long collaborative course with over 20 international instructors and 55 video lessons. Click here to find out more. Now let me tell you more about this painting. I asked in the Paint Your Heart and Soul 2018 Facebook group what students would like to learn from me a few months ago. Most wanted to learn to use oil pastels, and many people have also expressed that they wanted to go beyond just painting pretty young girls’ faces. They wanted to have more variety. So I asked myself, how do I best serve my students? Beyond the obvious answer of oil pastel techniques and not a young girl’s face, I also wanted something meaningful and inspire my students to uncover meanings for their own artwork. Given my strength is in portraiture, I’ve decided to paint a portrait of my mum. Why Van Gogh and His Almond Blossoms? My mum’s Chinese name means plum blossom, and she recently talked about wanting to get a plum blossom tattoo. This immediately made me think of Van Gogh’s famous Almond Blossom painting. Well, I know there are differences between almond blossoms and plum blossoms - the petals and how the flowers attach to the branche and etc.. But those small differences are minor and insignificant comparing to the inspiration and the meaning. Don’t let perfectionism stop you in the creative track! The color scheme in Van Gogh’s Almond Blossom painting is also perfect for teaching the Tetrad color scheme. That’s before we even mention that the texture you can naturally create with oil pastels can easily be a little Van-Gogh. There are many ways to draw and paint, even if you want to get a likeness. The easiest ways are to trace or use a projector. You can use a grid to help with your drawing. You can also your pencil as gauge to make measurements as your draw. One fun and quick way is to simply draw free-hand. And this is what I did before I started the painting. 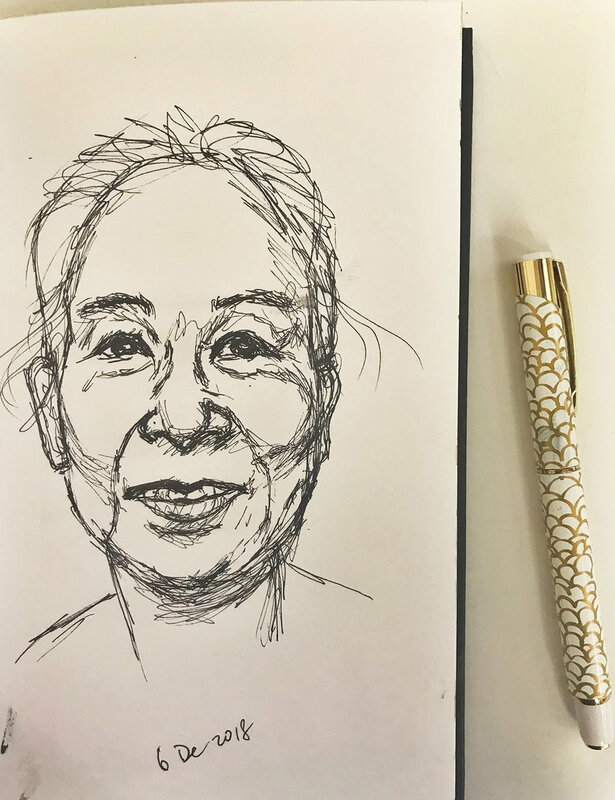 I used an ink pen to make some quick 10-minute sketches to get familiar with her features. I don’t use any pencil and there’s no erasing. I’m going to include this process as a real-time bonus video as my main lesson, too. If my lesson inspires you, click the button above to learn about this incredible course and amazing lineup of art teachers. Early Bird Special of $95 (for 55 lessons) has been extended to 9th December 2018. After that, it goes back to regular price of $129. See you in class next year!